Hiya guys! So normally I'm like very excited about polish, but with this collection I'm just over the moon. It's always a little extra special when I swatch a collection that has meaning to me, on a personal level. Let me explain! 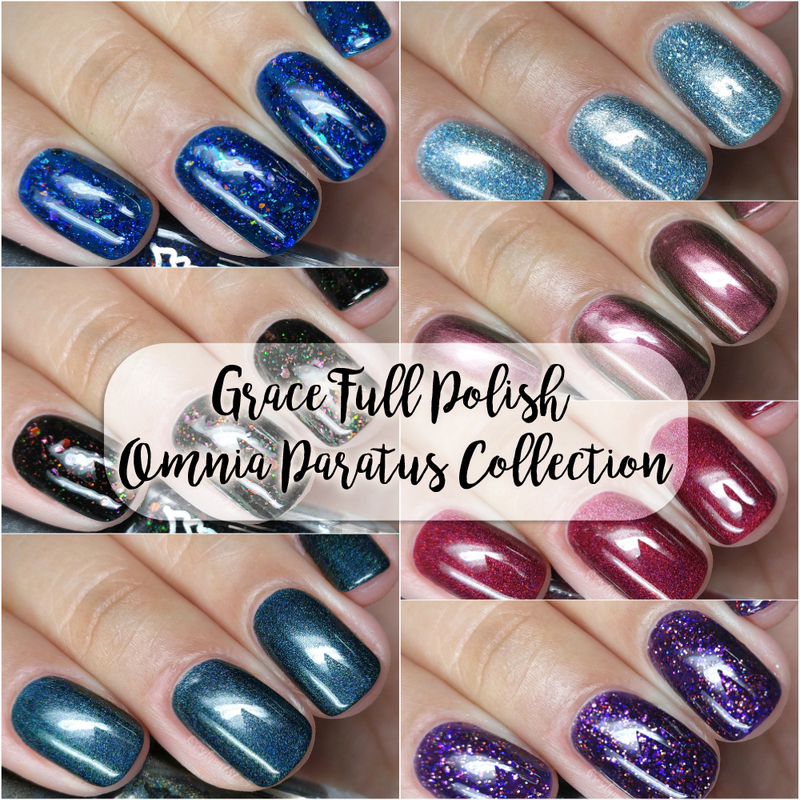 Today I'm sharing swatches for the In Omnia Paratus Collection by Grace-Full Nail Polish, inspired by the series Gilmore Girls. Back when at the end of last year when I hurt my back, I was unable to move or walk for a solid two months. This meant a lot of lonely days in bed where I discovered the show Gilmore Girls on Netflix. I binged through the whole series and by the end of it felt such a connection to the characters. I had even acquired some of Lorelai's quirks, haha. Now let me tell you a little bit about this fairly large collection. There are eight polishes four holos, a multichrome, chrome flakie, micro-glitter and a jelly glitter. I'll only be sharing seven of the eight as one was missing from my package unfortunately. But trust me guys, these will be more than enough to make you fall in love. Without further ado, let's get to the swatches! 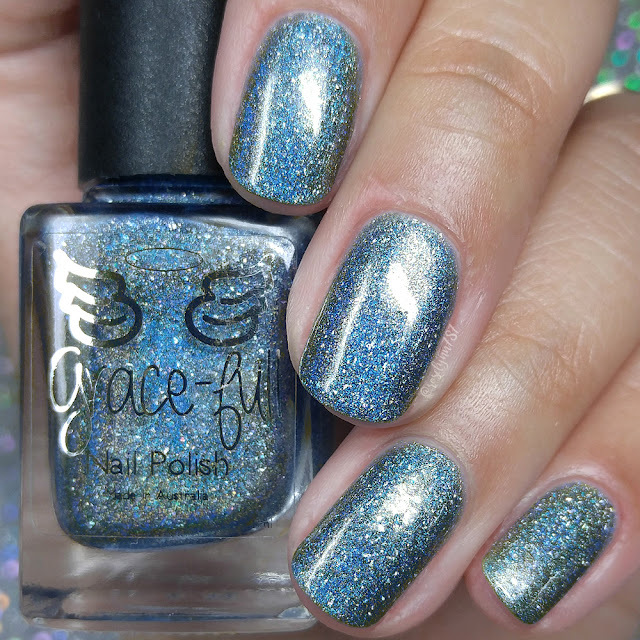 The In Omnia Paratus Collection by Grace-Full Nail Polish is now available for purchase. Each full-size 11mL bottle retails between $9.50 to $11.50, depending on the finish. 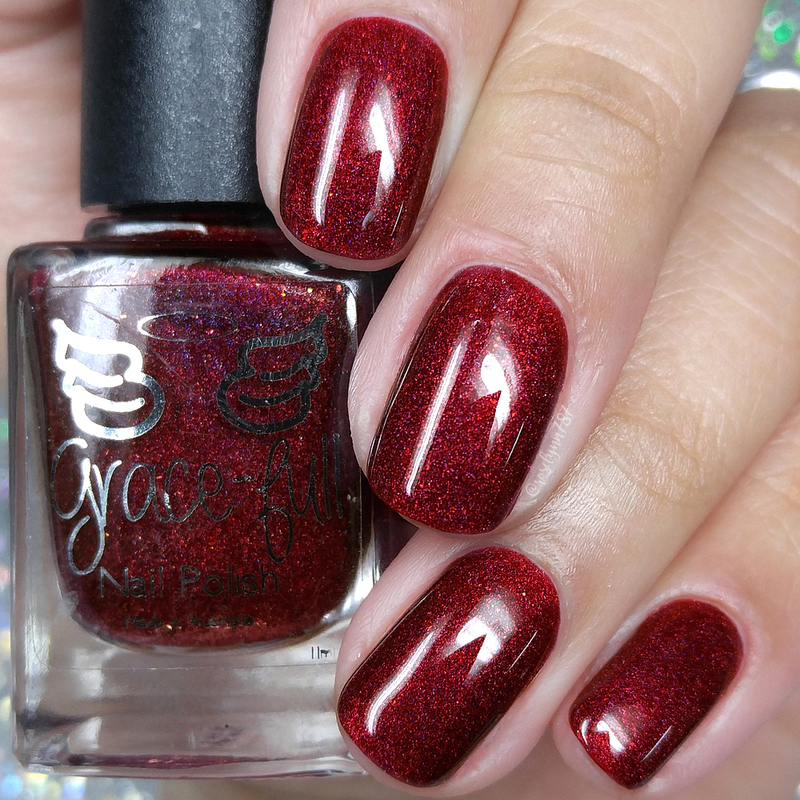 Vale Richard can be described as a rich red holo with gold flecks throughout. Starting this review off with one of my favorite colors in this collection. After all if you've been here before then you know I am all about a vampy red. Not to mention, it's definitely very Fall appropriate as well. My photos really don't do any justice to the gorgeousness of the holo in the finish. Thoughts From the Maker: Oh Richard, how sad it was to continue our Gilmore Girl journey without you. 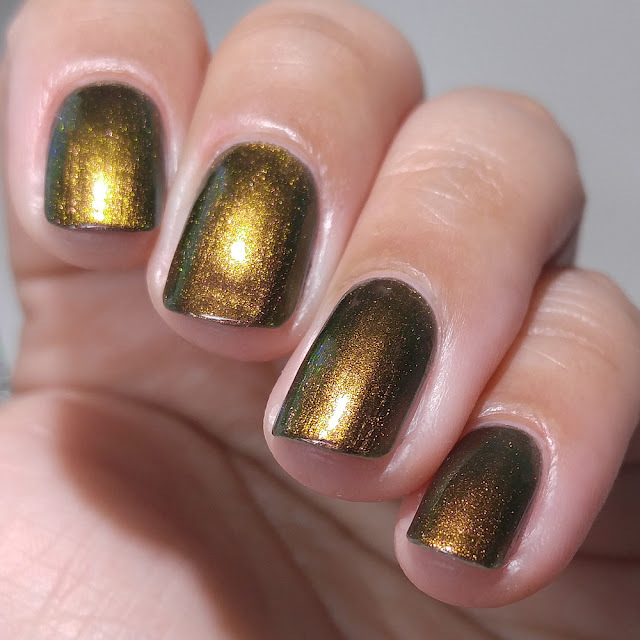 An old leather book with gold writing on the cover inspired this polish. Vale is another word for farewell. The formula has a very opaque application, but it's not quite a one coater. It has a nicely balanced consistency, not too thick or too thin. I also experienced no staining on removal to my nail beds or cuticles. Shown in two coats and sealed with a glossy topcoat. Please note: there is some minor separation in the bottle, but it does not affect the application whatsoever. But because of that this shade has been discounted to $8.50. I'm the Man can be described as a black jelly with red and copper flakies and iridescent glitter that moves from red to green to gold. Thoughts From the Maker: I’m the Man is the song Hep Alien sang in the return movie. 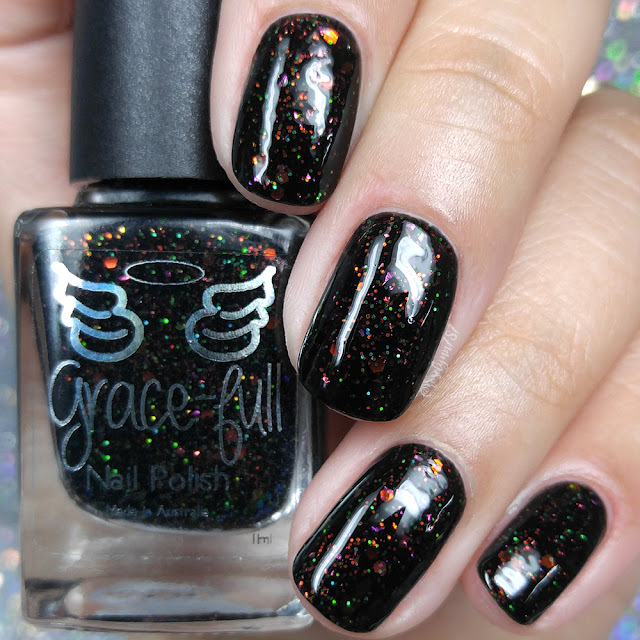 The formula has a sheer application as expected for a jelly finish. Consistency wise it leans on the thin side, but it's manageable and doesn't run to the sides. There are so many glitters in each brush stroke, needless to say no need to fish for any. It dries down to a gritty finish that smooths out perfectly after topcoat. Plus it gives it that squishy look that I adore in a jelly! Shown in three coats and sealed with a glossy topcoat. Yes, Purple can be described as a purple jelly base with micro glitter in both holo and metallic in shades of pink, purple, gold and copper. 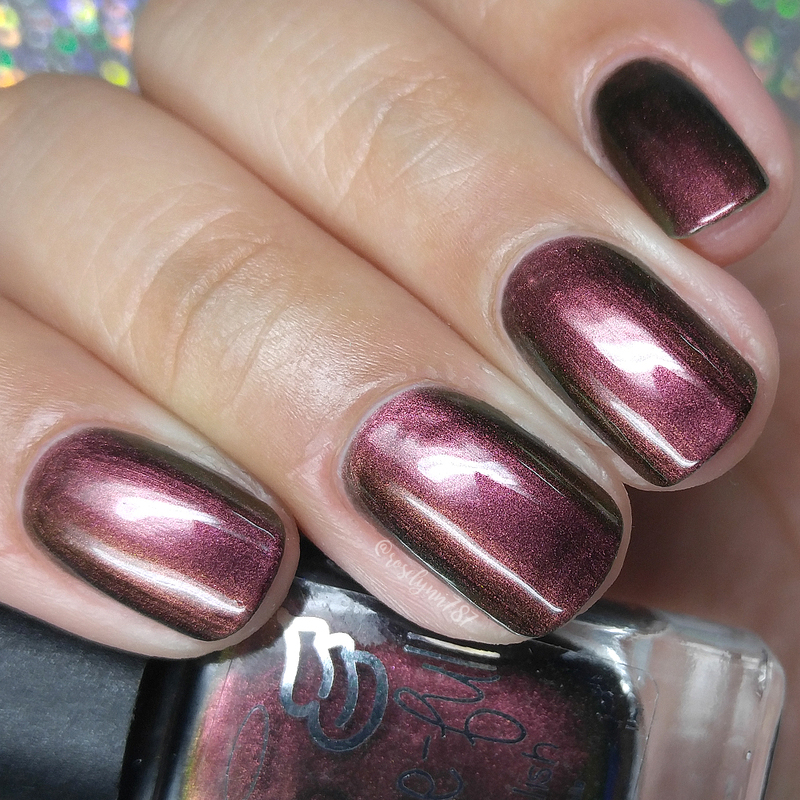 Thoughts From the Maker: This shade is inspired by Lane and especially the time when she dyed her hair purple only to dye it back again because she was afraid of her Mothers reaction. The formula has a sheer application as expected from a jelly. 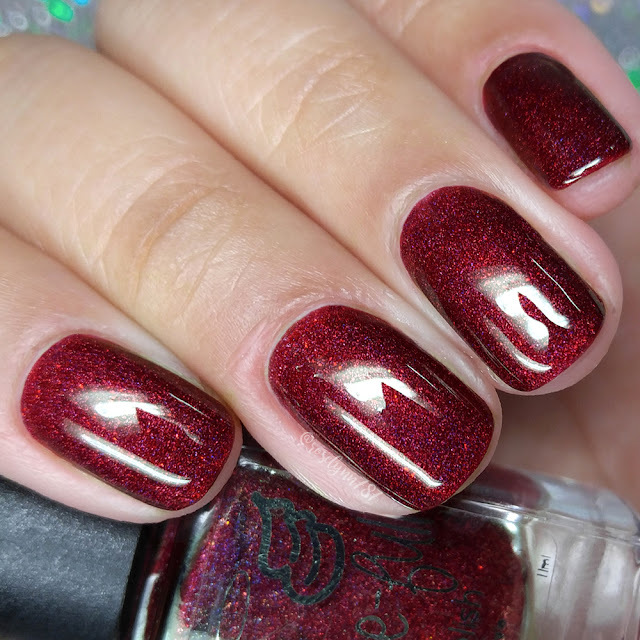 It builds-up really nice and even on the nail with plenty of coverage. Consistency wise it's very balanced and easy to work with for the layering. It dries down to a textured finish, but smooths out after topcoat. I experienced no staining on removal to my nail beds or cuticles. Shown in three coats and sealed with a glossy topcoat. 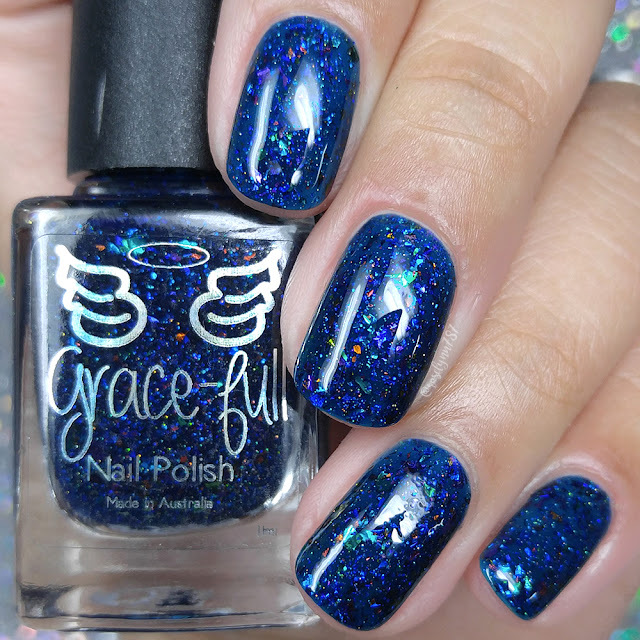 Ace can be described as a deep royal blue jelly with chameleon flakies in blue, purple, pink and turquoise with holo micro-glitter throughout. 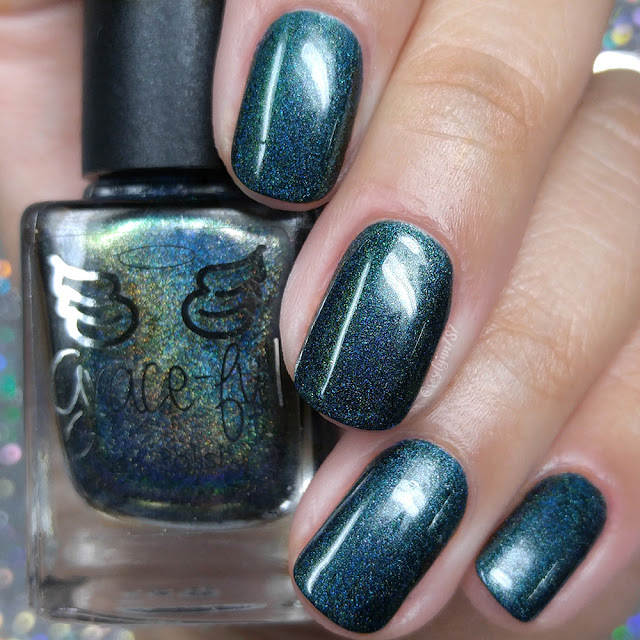 This collection has quite a few jelly polishes, which is honestly so refreshing. It's been a hot minute since I have seen so many in one release! But out of all of them, this one by far reigns supreme. 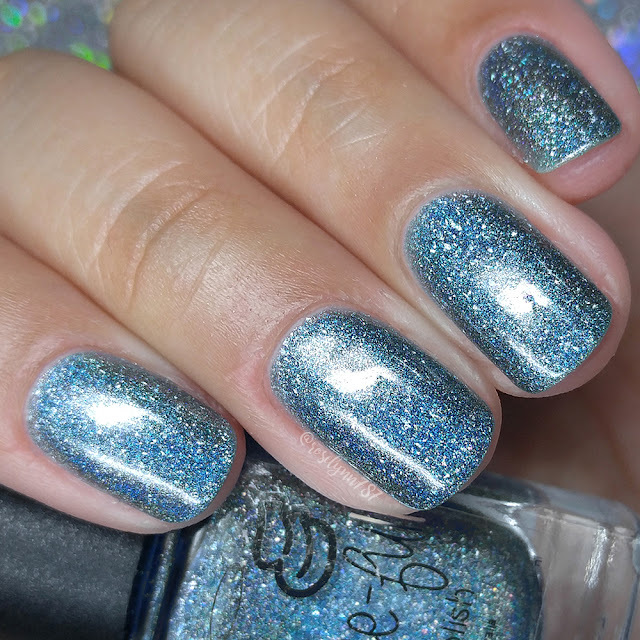 Not only does it have a gorgeous squishy finish, but the flakies create a pool of depth. It's like getting lost in a sea of blue sparkle! Thoughts From the Maker: Logan ‘sigh’ I dislike immensely the whole story line of his affair with Rory, but for some reason I’m still team Logan. 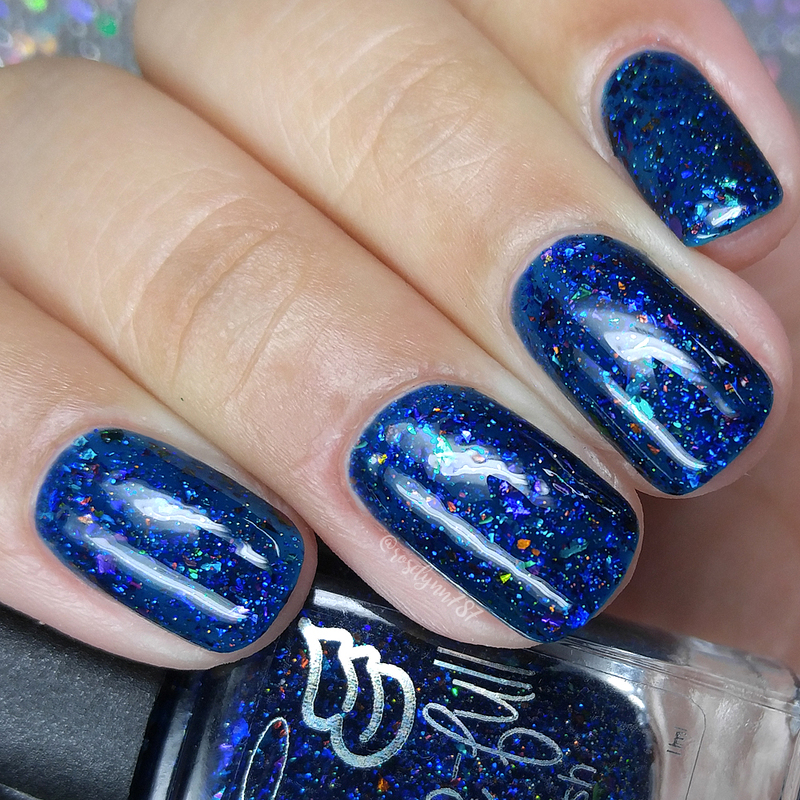 This polish has a gorgeous rich blue base which screamed Logan at me, filled with colour changing flakies in a jelly so they change colour perfectly represented Logan to me. The name Ace is after the nickname Logan gives Rory. The formula has a sheer application, which is again as expected for a jelly. There was still a minimal visible nail line, but there is so much going on with this shade that I didn't mind it. It has a nice balanced consistency, not too thick or too thin. And dries down to a gritty finish that smooths out after topcoat. I experienced no staining once again on removal, woot! Shown in three coats and sealed with a glossy topcoat. The Subsect can be described as a green holo that flashes silver. And here we have my favorite among favorites and my pick as absolute must-have! It's so rich and Oh and... I'm Team Jess all the way, haha. 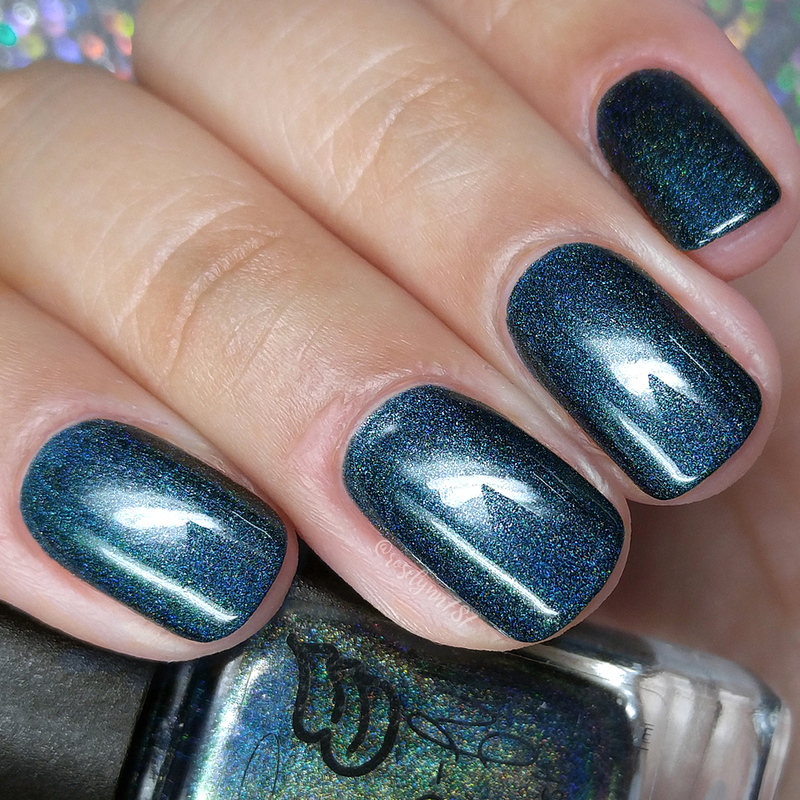 Thoughts From the Maker: Jess – Strong, mysterious yet irresistible is what I wanted the Jess polish to reflect. The name is the name of the book Jess wrote. The formula has a very opaque application, an easy one coater no doubt. I did end up adding a thin second, but only for more of the holo sparkle. It's very smooth all around and has a perfectly balanced consistency. And ready for the best part? No staining! Shown in two coats and sealed with a glossy topcoat. Dodge Lancer can be described as a light denim blue holo with holo flakes. I don't think this even needs to be said, but this is hands down another favorite of mine. It's so gorgeous and photos can do the sparkle no justice. This one absolutely comes to life under direct sunlight. Thoughts From the Maker: Dean’s polish had to capture one of those moments of young love between Rory and Dean. Inspired by the colour of the Dodge Lancer Dean repaired and restored for Rory. The formula has a sheer application with fantastic build-up for full coverage. The consistency leans on the thin side, but it's manageable and ends up helping with the intensity of the glitters. It dries down to a gritty finish, but can be smoothed out after topcoat. Shown in three coats and sealed with a glossy topcoat. Ooober can be described as a multichrome moves through green, red and copper. 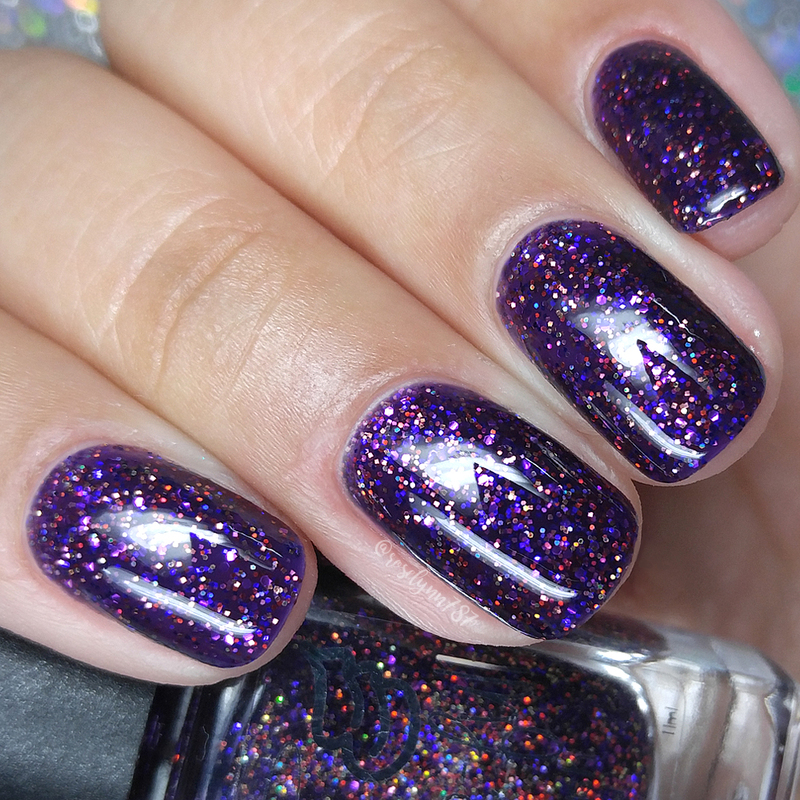 Thoughts From the Maker: Kirk’s polish had to be a plain yet complex polish. This multichrome is far nicer on the nail and I think suits Kirk to a tee. The formula has a sheer application, but builds-up perfectly for full-coverage. Consistency wise it's very well balanced, not too thick or too thin. Smooth throughout and dries down to a natural high-shine. Shown in two to three coats and sealed with a glossy topcoat. And here's the same polish at an angle in LED lighting. Talk about a color shift! I ended up showing my husband the photos and he thought they were two different polishes, haha. 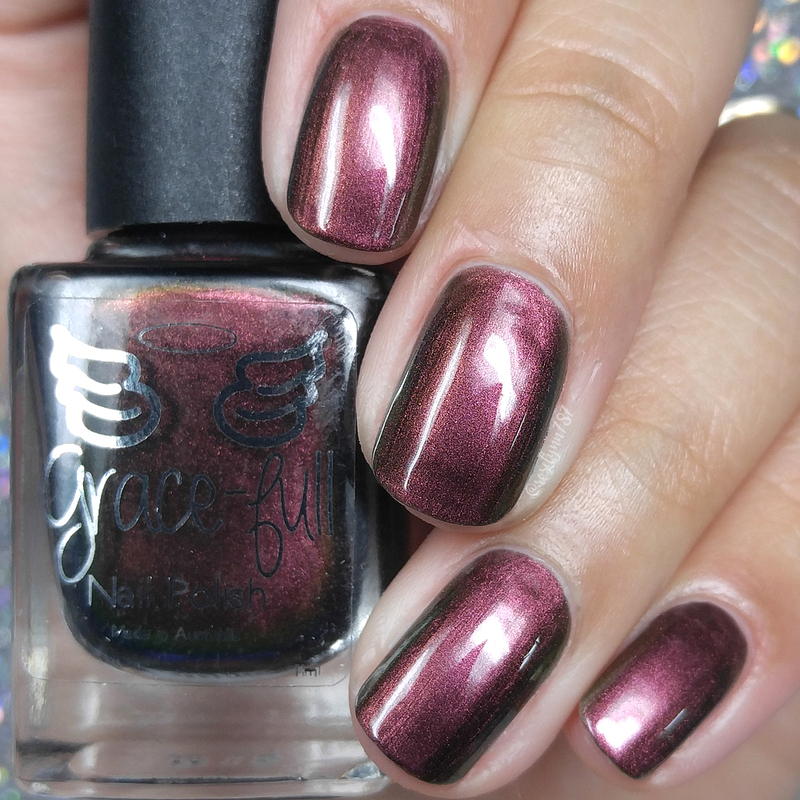 To recap, the In Omnia Paratus Collection by Grace-Full Nail Polish is now available for purchase. Each full-size 11mL bottle retails between $9.50 to $11.50, depending on the finish.